Somewhere in this home office there is a 78 rpm recording of Jack Kaufman singing “Lucky Lindy” and “Lindbergh, the Eagle of the USA.” The record was part of the hype that followed Charles A. Lindbergh’s solo flight from New York to Paris in 1927. 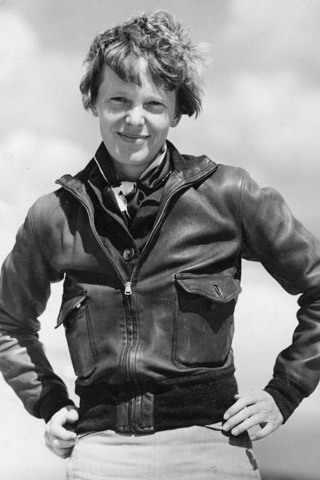 If a female aviator were going to be cast as Lindbergh’s counterpart, there was only one thing about Amelia Earhart that qualified her: She vaguely resembled the pilot. Where flying acumen was concerned, there were numerous women whose experience, skills, and breadth of knowledge far exceeded Earhart’s. As it turned out, that didn’t matter. 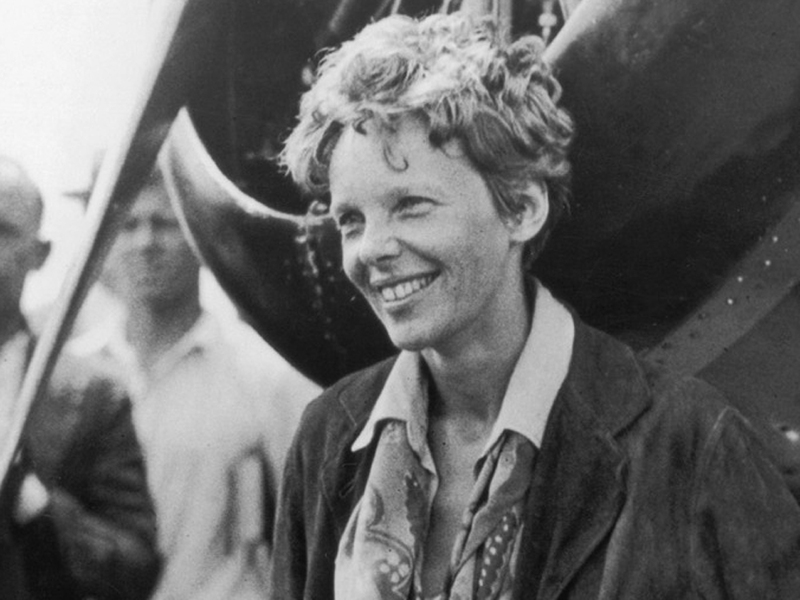 Earhart had “the look” — or, at least, enough people thought so to make her marketable as “Lady Lindy,” and so, she became the legend and the other women are forgotten by all but students of aviation history. Some things never change. I read about that in “Amelia Earhart: The Turbulent Life of an American Icon,” by Kathleen C. Winters. Winters, who died last August, was an aviation historian, biographer of Anne Morrow Lindbergh, and a licensed pilot. In short, she knew a lot about flying and her knowledge gives this book important context. I think it was because of her respect for flying that she took an unfiltered look at Earhart and presented her in what for many readers, including me, is a new light. 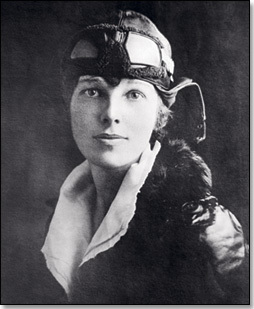 Not that Winters went after Earhart; on the contrary, she seems to have recognized Earhart’s basic decency and approved of Earhart’s sense of adventure and her independence, her part in the campaign to promote commercial air travel, and especially her insistence and practical demonstrations that women were capable of undertakings once thought the sole province of men. But Winters shows in some detail that Earhart was undisciplined, sometimes even careless, and that she wouldn’t take responsibility for her mistakes. But although there could have been no Amelia Earhart legend without Amelia Earhart’s cooperation, the magician who created the phantom heroine was Earhart’s husband, George Putnam. 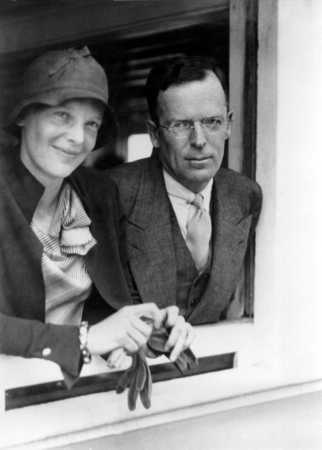 Putnam, an opportunistic book publisher at the time, played a critical role in booking Earhart as the first woman to fly across the Atlantic Ocean — a year after Lindbergh’s solo flight. Earhart flew, all right, but she never took the controls, because she was incapable of handling the sea plane that made the flight and because she hadn’t learned to fly by instruments alone — something that could, and did, become necessary over the ocean. A two-man male crew handled the flight and Earhart was “baggage,” as she herself said. But Putnam created so much publicity — much of it exaggerated or just plain false — that Earhart became permanently larger than life, certainly larger than reality. Putnam, who eventually left his wife and married Earhart, also managed the rest of her career, encouraging her in a series of risky and often pointless performances and booking her in never-ending schedule of public appearances that financed the couple’s flamboyant lifestyle. Amelia Earhart after her own solo transatlantic flight in 1932 - 1700 miles shorter than Lindy's. 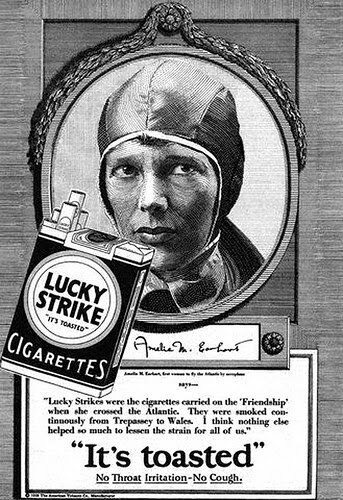 It’s symbolic of Putnam’s whole approach to Earhart’s career that he signed her, over her objections, to appear in a print ad for Lucky Strike cigarettes, although Earhart did not smoke. The ad didn’t say she smoked, but the implication was clear. What Putnam didn’t anticipate was a strong negative push-back from a public — particularly a female public — that didn’t approve of women smoking. Earhart was charming, and she did set some speed and distance records, but her indelible place in the public consciousness was based on Putnam’s manufactured image — and on her disappearance in 1937 while she and navigator Fred Noonan were over the Pacific Ocean during an attempt to fly around the world along the equator — a feat that would have had virtually no significance in aviation by that time. Winters points out that Earhart still had limited understanding of radio operation and that neither she nor Noonan knew Morse code. A naval vessel — in a typically improper use of public resources to support Earhart’s private escapades — was trying to monitor Earhart’s approach to tiny Howland Island where a landing strip had been constructed for her at public expense. The crew couldn’t keep contact with the flyer, and all indications are that she and Noonan couldn’t spot the minuscule island or wandered off course and wound up in the ocean. 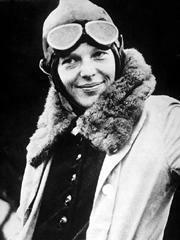 Bone fragments discovered late last year on a Pacific island are being examined for any connection to Earhart. Winters notes a melancholy detail: An experienced flyer encouraged Earhart to have the rudders and wing strips of her Lockheed painted red so that it would be easier to spot if it went down. Earhart liked the plane’s paint job fine just as it was. 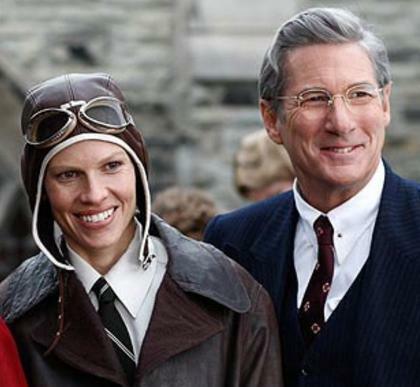 Hilary Swank and Richard Gere as Amelia Earhart and George Putnam in the 2009 film "Amelia"
Amelia Earhart: Is it you at last? I see by the papers, as it were, that a scientist in British Columbia is going to try to identify bone fragments believed to be those of Amelia Earhart by using DNA technology. Earhart went missing in July of 1937 and was presumably killed along with navigator Fred Noonan during their attempt to fly around the world along the equator. Their bodies were never found, but bone fragments that were found on a Pacific island late last year are being examined at the University of Oklahoma to determine if they are the remains of Earhart. A story published today by The Canadian Press reported that a forensic archeologist at Fraser University in Vancouver is going to try to recover Earhart’s DNA from envelopes that contained letters written by Earhart. The letters were opened at the ends, so the flaps are intact. The premise of the study is that Earhart probably licked those flaps in order to seal the envelopes and that DNA from her saliva may still be present. This news breaks while I’m in the midst of reading a recent biography of Earhart by Kathleen C. Winters. I’ll probably post a review here in a few days. From a practical point of view, it may not matter very much whether those bones are Earhart’s or not. As there always are in such cases, there are folks who want to believe that the explanation for her disappearance is more complicated than that her plane went down, but there is no evidence to support them. On the other hand, anyone with a sense of history hates stories with missing conclusions. So a definitive finding that those bones belonged to Amelia Earhart would serve two purposes – putting unfounded theories to rest and putting the period to an historical epoch.